In this example, I’m going to share a simple tip to make custom horizontal android ScrollView. 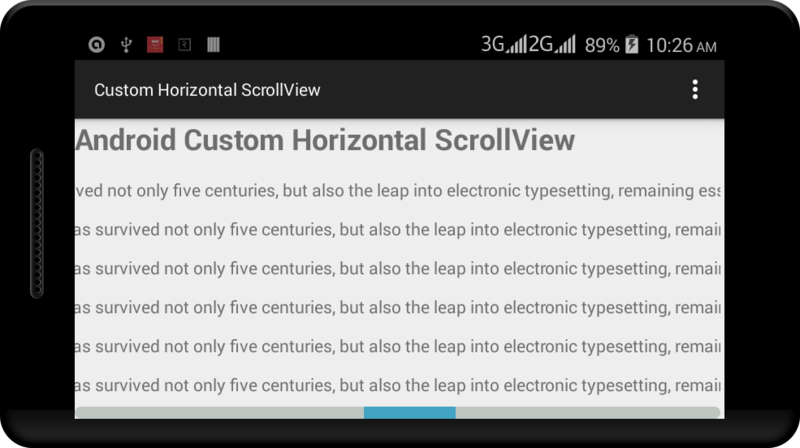 Android has provided us lots of ScrollView attributes and with the help of these attributes, we can customize HorizontalScrollView in our own way. Let’s start by creating a new android project to customize android horizontal ScrollView with following information. Look at the following code I have added scrollbarThumbHorizontal and scrollbarTrackHorizontal xml attribute to customize android HorizontalScrollView. Following is the final code of xml layout file. Create two xml files horizontal_scrollview_track.xml and horizontal_scrollview_thumb.xml inside res/drawer and add following code. Your default java activity file looks like this. Now, run your application. Your application looks like above screenshot. Download complete Android Custom Horizontal ScrollView Example project source code from GitHub.